Once Upon A Time…. It can begin that way but where the tale turns to from there is any ones guess. 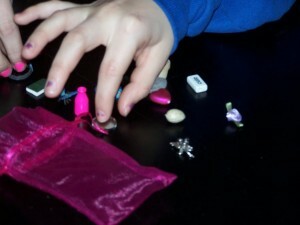 With the Think-a-lot Fairy set of trinkets imagination is the key to a classic or not so classic fairy tale. With cues from the selection of a tiny item the hero or heroine may be looking to the magical powers of a mirror and then swept away on a skateboard. To children they are a key to imaginative play and release of the inner child for adults. Fairy Tales as Spoken Word are not the only delight. This set makes a fun game of concentration. What piece is missing and acquiring the skills of quick memory recall are a great learning asset. Want to try to finish this tale from the picture above make your ending using the items not mentioned and put it in the comment box. Once upon a time a magical Blue Butterfly was released in Cambridge, Ma. it flitted about the country side. Wherever it landed stories unfolded of the ancients and the new, in small gatherings and large venues. Sometimes the Blue Butterfly was seen near cool waters, in green gardens and where rare Books stand side to side. Words flowed like fine wine from a Goblet and were sweet to the lips and ears alike. A cold north wind blew around the corner. It always comes, and has for time eternal, its presence a sign of……..
Go ahead finish it in the comment box there is no limit to the number of ways this story can be told. 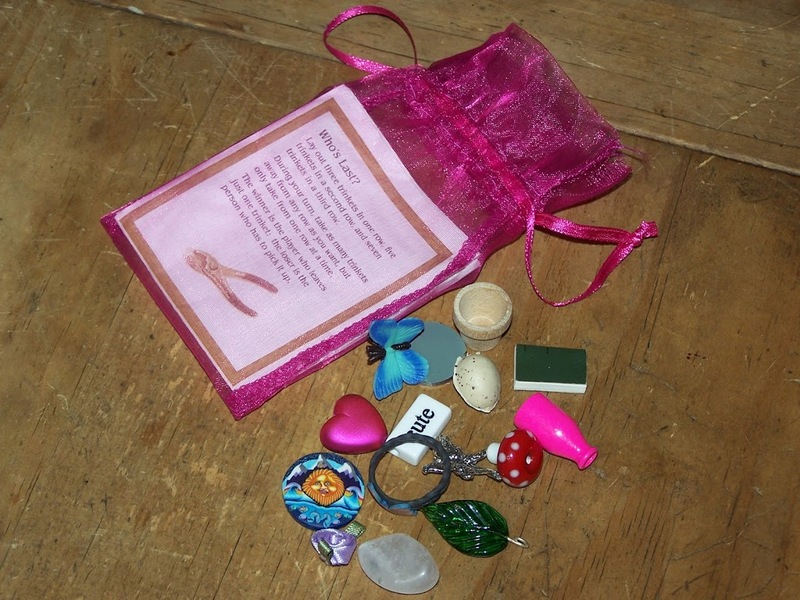 Left to use: stone, purple rose, butterfly ring, pink bottle, heart, seed, leaf, mushroom, cute, sun medallion, mirror. To order see www.think-a-lot.com who will you gift with the magic of story?